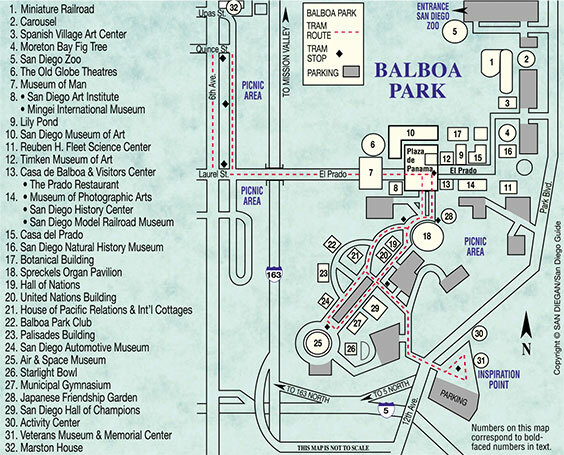 A visit to Balboa Park would not be complete without visiting the 37 working artist studios managed by over 250 local artists and see and speak to many of these artists while they create their works of art that are all offered for sale. 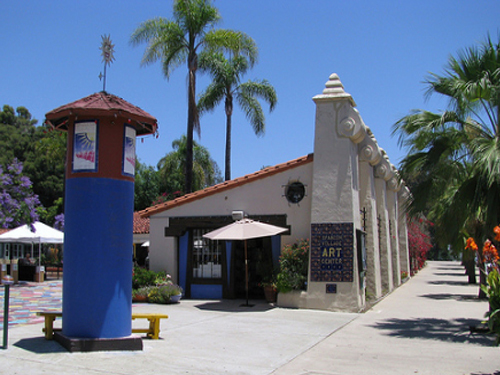 This unique venue is showcased in The Spanish Village Art Center at 1770 Village Place in the heart of Balboa Park (619-233-9050). 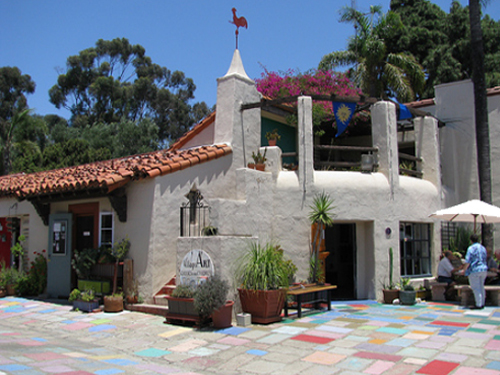 The Spanish Village Art Center is nestled in the north eastern end of beautiful Balboa Park between the San Diego Zoo and the Natural History Museum. And there is a large parking lot literally steps away from the Spanish Village Art Center itself. Family and pet-friendly Spanish Village Art Center, creates a unique one-of-a-kind venue were juried local artists create and sell arts and crafts in 37 individual, working, art studios. Each studio is manned by an artist. And they are at their best in explaining their creations, which are all unique, handmade, original, artwork of all kinds in all mediums. This is the biggest art colony in San Diego. Yet, it is both informal and fun to visit often. Plus, they have a lot of seasonal activities that brings locals back again and again each year. Unquestionable, the charming setting of the cluster of quaint little studios situated around a spacious open-air patio is what gives this experience such a great appeal. 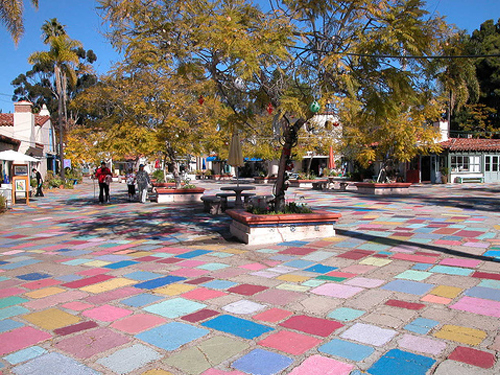 And virtually everyday a different artist or a series of artists can be seen showcasing their work on the colorful patio shrouded by trees. And to add a touch of class to this romantic venue is often a bit of live music played by a talented guitarist sitting under a tree in The Spanish Village Patio. Something should also be said about the painted tiles that adorn the patio. They’re eye-catching! A real plus, is that you can purchase all of these museum quality Fine Art and Contemporary American Crafts at reasonable prices because you are buying directly from the artists. So there is no middleman. And you can interact with the artists at work in their individual studios. It’s a beautiful way to spend the day discovering beautiful Balboa Park. Most studios and galleries accept credit cards. Better yet, admission is Free to everyone of these 37 working artist studios/galleries, which host over two hundred independently juried local painters, sculptors, metalsmiths, jewelry designers, clay artists, gourd artists, photographers, printmakers, fiber artists, basket makers, mixed-media artists, glass artists, enamel artists and many more arts. The 37 Spanish Village Art Center working artist studios are open to the public 11 a.m. – 4 p.m. everyday except Christmas Day, Thanksgiving and New Years Day. Come experience the process of creativity. And be sure to consult the SAN DIEGAN Calendar of Events for the many ongoing juried shows and sales to the public. Several times a year they have huge seasonal sales, which are displayed in the courtyard. So you can browse to your hearts content before you make your purchase. Historically speaking, these quaint buildings and its romantic courtyard were built in 1935 to depict a charming old village in Spain for the second California Pacific International Exposition. Today this colorful and charming Balboa Park attraction is home to over 250 of San Diego’s best and most talented artisans and craftsmen. So come and explore this one of a kind exhibit and explore one of the world’s most unique attractions. 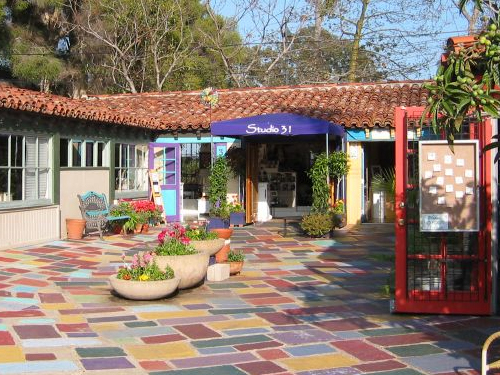 You will soon discover that The Spanish Village Art Center is home to The San Diego Potters’ Guild, Art Glass Guild of San Diego, Sculptors Guild, Enamel Guild, Southwestern Artist Association and the San Diego Woodcarvers Guild. So it’s San Diego’s showpiece for local professional artists at work! A real crowd pleaser is the Southwestern Artists’ Association Gallery, with its grand entrance and marque. This must see gallery features the works of talented local artists who always have something new to see. Their juried works of art make perfect gift. But this reviewer couldn’t part with some his discoveries and has them proudly displayed in his home and office. You will undoubtedly be impressed with your finds as well. 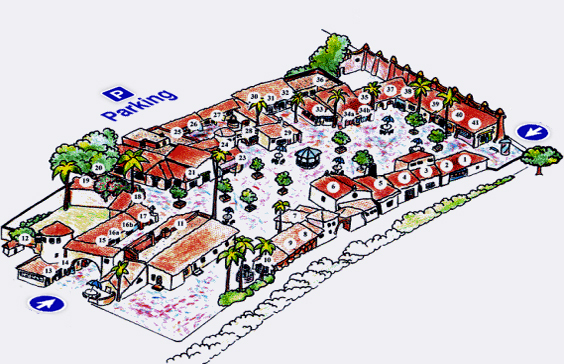 The Spanish Village Art Center is also a perfect setting for weddings, parties and corporate events. The unique appeal of this venue is its Spanish architectural setting and open air patio. Everyone who visits The Spanish Village Art Center loves it and so will you. You can begin or conclude your discovery of these fascinating working studios by following the map, which are coded with map numbers that correspond to their studio numbers (see map). And the number of each studio is clearly marked on the front of each studio. 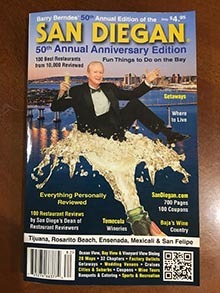 As an added benefit, sandiegan.com has added the names of many of the artists you will undoubtedly come to see again and again at your favorite studio. The first studio on your left as you enter The Spanish Village Art Center from the south is where you will find museum quality oil paintings being created, right before your eyes, by Carol Foster and Yanush Godlewski. These talented artists have over 25 years of experience and offer a treasure trove of original seascape paintings in oils. If you have a photograph of a seascape and want it recreated to hang on your wall, these talented artists will bring it to life. Or perhaps you’d like a beautiful San Diego seascape to remember your visit to San Diego? Then you have come to the right place. Featured here are a wide array of watercolor paintings by Kay Frances Hubbard, photography by Denise Strahm with eye-catching ceramic tiles by talented Kathy Waller. You must stop in and say hello to the friendly and talented Don Knapp, who has made a name for himself with his eye-catching mixed media paintings and collages. He is a homegrown talent. Here is the San Diego Enamel Guild, which is the first of many active guilds and is a must see gallery featuring the best of the best in exquisite enamel works of art in copper, steel and silver. And the guild has a huge list of talented local artists to choose from including: Pat Aiken, Marla Anderson, Steve Artz, Theresa Beatty, Jane Beiser, Karim Carlock, Sue DePriest, Elizabeth Fischer, Carol Haney, Tiffany Hauschild, Joan Hernandez, Tree Hill, Sandy Hull, Edith Kahn, Jean Kreutzer, Margaret Landstrum, Sally Lyons, Barbara MacKusick, Karla Maxwell, Diane Montag, Cynthia Pardoe, Kimberly Parry, Rudy Pengler, Shirley Perkiss, C.J. Perry, Darielle Peugh, Adriana Rodstrom, Rick Schneider, Dorothy Stephenson, Vivian Stillwell. Laura LeMaster – Silk painting. And an extensive list of classes are offered: Class Schedule: Village Morning Art Classes & Exposure to Art Charlotte Ibach. Explore Balboa Park and collect natural objects to create walking sticks, animal masks, crowns and more. Creative Clay with Elizabeth Woolrych. Learn basic hand building, discover clay sculpture, use a potter’s wheel and create bowls, masks, animal mugs & rattles! $140 per week. Classes are for children age 6 and up. Classes begin at 9:00 am and end at 12:00 noon. Showcased here are eye-catching fused glass jewelry handcrafted in gold and silver by Grace Miller as well the works by Sandra Davis in the medium of fused glass and jewelry. Here too are the one-of-a-kind photography by Cyndy Campbell weaving by Brigid Delano jewelry by Mershid Arjmand and Arleen Hammer and paper art by Tracy DePue. Here is a fun studio with a nice array of art in virtually all mediums starting off with mixed media by Jean Schindler followed by stunning ceramics by Mary Baldwin. Neal Evans showcases his works with paintings, colored pencil and boxes here too and Kathi Vargo offers gourds and jewelry and David Vargo offers mixed media art and Joyce Koenig features works in glass, hot lampwork and jewelry. Be sure to ask a lot of questions about how these works of art are made. It’s part of the fun of being able to actually speak to the artists themselves. For an eclectic array of exquisite unique works of art in a wide array of mediums by talented local artists, this is the place. Chris Stell offers dichroic glassware and jewelry, Gail Woods creates her offerings in polymer clay; Jan Petec does lampwork glass beads and jewelry, Vaughan Nelson is a ceramic artists and Howard (Mick) Mosley offers eye-catching objects made in cold glass, metal sculpture and mixed media. Here the works of Charlotte Ibach is featured with clay masks, clay sculpture, jewelry and raku. If you’d like to learn how to create your own works of art in these mediums, Charlotte Ibach offers classes. Give her a call at 619-818-8120. Eye-catching gems such as tourmalines and even gold has been discovered right here in San Diego. So venture into this large building and get educated on another aspect of what makes San Diego such a rare gem indeed! Here you will find huge glass cases displaying an almost unlimited selection of quality jewelry by talented jewelers such as blue ribbon winner Judith Moore [wiredadorned.com]. It’s a browsers paradise. Here too in this rather large building are many other glass cases filled with virtually every mineral and gem mined in San Diego as well as fossils. Classes are offered in cabochon cutting, faceting, silver fabrication, casting, enameling, bead stringing, rock carving and sphere making. Visit their website [sdmg.org/] for a complete description of their multiple offerings including how to become a member and learn more about the physical beauty of San Diego County. Don’t miss this one-of-a-kind must see gallery featuring museum quality eggshell designs from Four Masters of Egg Artistry from Old World to the Contemporary made from featured artists include Frank Cascaini, Anita Downs, Linda Kline, Ana Garcia – Fiber-Felting, Beadwork, Roxanna Maria Polymer Clay and Kathi Ruiz Fiber, quilting. This studio is home to yet another masterful artist whose works adorn the galleries of the rich and famous. He is Doug Snider and his medium is contemporary ceramic sculptures. Don’t miss either one of these galleries. Adult Pottery Classes: are offered Mon. or Wed. 6 p.m.–8 p.m. with continuous enrollment of 8 sessions for $200. All materials are included. For reservations call (619-232-3305). Featured here is a one-woman show featuring sand paintings and sculptures by Mary Renner. Features the works of four talented local artists which include: Vicky DeLong who works in 3D Mixed Media & Pottery, Linda Iles offers exquisite jewelry, Mary Ella Bowles works with mixed media in 3D, photography, gourds and Ally Benbrook is a specialist in watercolor painting. Tucked away in a corner, but well worth discovering are the Hand blown glass by Andy Cohn and Partners. Andy Cohn is a expert in the art of hot blown glass along with Kevin Baker, Lance Burcham, Susan, and Art Harris and the medium of Joan Nies is oil paintings and printmaking. Art Classes: in the art of Blown Art Glass by appointment: Classes are available for individuals wishing to learn glass blowing. Introductory to advanced lessons available. All classes are one-on-one, all materials supplied. 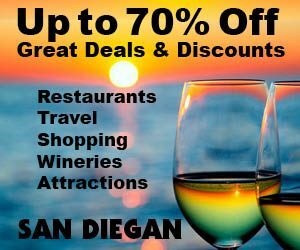 For reservations call 619-338-0441. Oil Painting Drawing Classes: are offered by talented Joan Nies for both adults and high school aged students (619-850-6055). Easy to spot is the The Southwestern Artists’ Association. It has a large impressive and inviting marque. It is open daily from 10 a. m. to 4:30 p.m. (619-232-3522)the Gallery maintains an ever evolving exhibit of original artwork every month from its juried membership of over 50 local artists. The first Monday of every month, SWAA holds its membership meeting followed by an art demonstration, 10 am to noon. The Annual Juried Art Show is open to all San Diego County artists in the spring, and in the fall their Annual Art Festival is held on the patio. Southwestern Artists’ Association was founded in 1949. They have the largest membership in the Spanish Village Art Center. We believe the arts are an important part in the life of a healthy community. Our mission is to establish and maintain a gallery that extends friendships and promotes knowledge amongst San Diego county artists. Gallery 23 maintains an ever-evolving exhibit of original fine art paintings every month from our juried membership of over 50 local artists. The featured artists (Two-Artists Show and the smaller Alcove Gallery) are changed bi-monthly. 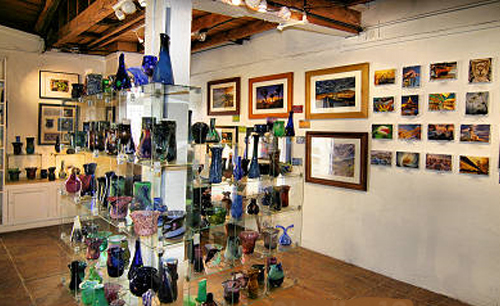 The gallery’s gift shop displays unique handcrafted items; jewelry, glasswork, basketry, polymer clay, carved gourds, painted eggs, miniature paintings and cards. In the spring we hold our "Top 100" and One Foot Show. This is an Annual Juried Art Show (open to San Diego County artists), Plein Air Contest, and our outdoor Art Festival & Sale in the fall. Membership meetings are conducted on the first Monday of the month starting at 10am followed by a demonstration given by a local artist, which is free and open to the public. Prospective members are invited to attend our meeting to learn more about the benefits of becoming a member of Southwestern Artists’ Association. Amy Sommerville offers hand painted and etched glass and Mirror works of art and?Alane Gray offers fused glass jewelry. The works of Martin Marshall in the medium of hot glass blowing is sure to please you. Patrick Cowan offers attractive and Sue Walker has created exceptional pieces in precious metal clay. This studio has 35 different glass artists in one studio! We have everything from handmade glass beads and jewelry to weathervanes! Blown glass bowls, plates, tumblers, fused light switch covers, paperweights, vases and stained glass sun catchers. They feature, blown, fused, torch worked, stained, mosaic, etched and custom glass. Our Glass Guild has sales two times per year on The Spanish Village Patio. They also offer classes and demonstrations. Come share their passion for glass! Please contact: Gail Pulkrabek 619-702-8006). Hector Aguilar specializes in black and white photography. Peter Acosta is a jeweler (619) 233-0013. Jeffrey Hammer also does jewelry. And for watercolor and works in mosaics look for the works by Edward Moores. Mark Moskowitz is a Printmaker and does photo etching. Classes are also offered in basic basketry using natural fibers. Call Lai Quon at 858-279-6602. For Jewelry Creating Classes contact Peter Acosta (619-823-3399) or Jeffrey Hammer (619-287-3187). When visiting Studio 26 you might be lucky enough to meet talented artist Lai Quon [basketlai@yahoo.com] who is both a master basket making and a oil pastel artist. Her wonderful works of art can be seen on display in Studio 26. As she puts it, “I enjoy expressing myself through colorful, whimsical, dog paintings, made from oil pastels on canvas, ranging in size from 16”x 20” to much larger canvases”. These eye-catching colorful oil paintings from the wall of the long, narrow, hallway that constitutes this funky rectangular studio. Here too in great abundance are a host of her organic, woven and coiled baskets, all one-of-a-kind, that line the shelves, which are her creations too! Dog lovers and lovers of whimsical art will undoubtedly fall in love with her extensive collection of art work devoted to man’s best friend—Dogs! As she says, “Dogs have been best friends and the love my life. They are loyal, loving, protective, goofy, soulful, creatures that sometimes display more humanity than humans. I have great respect for dogs, and therefore enjoy painting them. My colorful, whimsical, dog paintings are inspired from my love of dogs and my imagination”. “My approach is very much like a child. All appropriateness and correct techniques are thrown out the door”. The fact that it is definitely is not representational art gives her work exceptional charm”. “On good painting days, the dog, itself, seems to tell me how to create him. From spots to stripes, hot pink to chartreuse, the dog seems to create it’s own personality, quirkiness and whimsy. When someone looks at my painting, I like to believe, the eye of the beholder draws from his own emotions, and sees it in the dog’s expression”. “Oil pastels have a sensual feeling to applying the layers of colors, smoothing the oil pastels with my fingers, mixing and moving the colors. During the summertime, when the weather is warm, the oil pastels are softer, spread easier, move more quickly. My hands and clothing get covered and smeared with the colors, making me feel closer to the painting. I love it”. For a description of her eye-catching one-of-a-kind baskets she says, “Sometimes, when a change of pace in art is needed, I create natural fiber, organic, baskets. They are very calm, muted, primitive baskets. I glean the basket materials from fallen plant material that has fallen to the ground. I do not pick live material from a plant. The plant lives, sheds what it no longer needs, falls to the ground, I pick it up, and recycle it into a basket. It’s saved from the mulch pile and given a second life becoming my sweet and quiet baskets”. Embellishments, such as feathers, beads, old Chinese coins, found items, interesting shapes of wood and more, are used to decorate them. Usually she says she has to wait for a strong wind storm to knock down the material from trees in order to get the natural material need to make her baskets. “I create baskets with a loose idea versus a predetermined pattern, and l hope for the best. For making baskets, once you get into the art of making baskets, the experience becomes an almost hypnotic experience”. “In a time where computerization is all too prevalent and where there’s a space station in outer space, and international corporations rule the world, it is too easy to lose sight of Mother Nature and her nurturing and her beauty. I feel connected to all the basket makers throughout the millenium, and wish more people would pause, and think about the impact that Mother Nature still has on us all”. Connecting with the artists themselves is what makes visiting this art colony comprised of San Diego’s most talented professional artists so special. Your next stop on the tour should be to discover the works of Jane Stadulis, who offers a one-person show of beautiful jewelry and impressive watercolor paintings. Do stop in and say hello. Everything hand made from clay using various techniques and many styles and types of decorative and functional ceramics are created by over forty local potters in this guild. 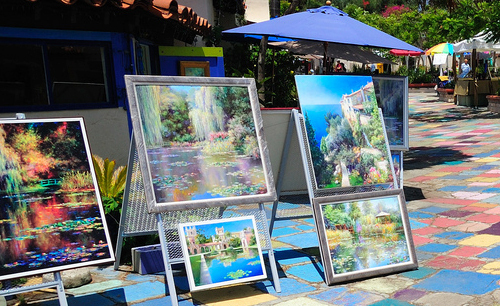 Semi-annual exhibitions on the patio of The Spanish Village Art Center: 2nd weekend of June and November. 10 a.m. – 4 p.m. Here at Studio 30 you will find the works for Ellie Hitchcock whose medium is Polymer Clay. Polly Mitchell does creative beadwork and Al Nashashibi creates painting using Acrylic. And Janet Nelson creates impressive quilts. There is so much talent showcased here that it should come as no big surprise that virtually every gallery offers some kind of art classes for all ages in all mediums. One of the most popular are their supper camps teaching art in several different mediums, including Chinese brush painting, beadwork, polymer clay and altered books. Especially popular are their summer camps for children. They are open to all children from 2nd – 8th grades. Each camp runs for a week and each day and offers a different medium. Contact Ellie Hitchcock at 619-236-1182 or email ehitchcock@cox.net to download a registration form. Randi Hawkins is a one-man shop offering 2D mixed media paintings worth seeing. Cassandra Shepard showcases her works in silk painting, mixed media 2D, metalsmithing, jewelry and pencil. Ramon Villon offers exquisite jewelry. Silk Painting Classes are offered by Cassandra Shepard and she can be reached at (619-230-0039). Shelley Madariaga’s passion is Gourd Art. Entry level adult classes are offered here in Gourd art making.To enroll call (619-275-5762). The instructor is Shelley Madariaga. Susan Ludwig specializes in fiber artist. Sue Britt offers colorful collage paper arts. Deb Gargula showcases her wonderful talent of colored pencil works. Danielle Deaton showcases eye-catching watercolors as does Sally Bly. Linda Lepeirs Slawson does photography and Laura Wells offers both jewelry and lampwork. Master crafts woman Maureen King offers exquisite works in jewelry and as a metalsmith. Everybody’s favorite is this patio and showroom filled with larger than life sculptures in all mediums. These exceptional works are all work done by local artists in bronze, terracotta, stone and etcetra in a variety of traditional and contemporary styles, that range from miniature to life size. They also have bi-monthly shows, featured artists & Sculpture Garden. Classes in Classical Sculpture are offered by Patty Palenschat who can be contacted via e-mail at p.palenschat@cox.net or via (858-692-8689). Cost is $35 for a 3-hour course plus materials. Judy Stinton is a seamstress extraordinaire! She creates wearable art that is both stunning and comfortable to wear. For a peak of what to expect visit judystinton.com. This unassuming studio could be easily missed, but don’t pass it by. Take the time to appreciate the works of this exceptionally talented artist. If you are searching for a stunning dress, this should be your first stop. Her array of talents include hand painted silk clothing and fiber wrapped jewelry, which are exceptionally beautiful to see. No less pleasing are the creations by?Dr. Carl Jepsen, who creates stunning feather and leather designs, which are so exceptional that they are truly one of the ten wonders of the world. Also here are unique beaded jewelry created by are Phyllis Wergeles Fogel and Liz Abbott offers fiber arts appliqué, which are all nestled together in this small “must see” gallery. This gallery is a real show stopper with an amazing display of wood work created by more than 16 artists with great flair. Once you get home you’ll probably wished you’d bought something here, so call Nan Bushley (760-728-0591) to have it shipped. Beverly Hartgrave shows off her unique sculptures and raku pieces combined with fibers, rocks and fossils. No less imaginative are the works of Chris Brown whose mediums are ceramics and mosaics and Jon Evans offers works in photography and Blown Glass (858) 663-9052. Teresa Rodriguez-Ross offers beautiful works in metal smith, jewelry, colored pencil and Patricia Salazar shows off her talent in colored pencil work and 2-D mixed media and Mindy Gersenfish-Turk offers one of a kind jewelry. Classes: in Textile Dyeing with Botanicals are offered. Learn how to transfer pigment from fresh flowers and leaves to fabric. Group classes are available for both children and adults. Contact Peggy Caballero (619-401-8428). Featured daily on the patio are one person must see shows! The Spanish Village courtyard patio is an ideal location and available for weddings and private parties. For more information please email: Vicky DeLong at vbde@cox.net.